A NASA solar sail once thought to be a goner is celebrating its comeback with a star turn as the focus of a space photo contest with cash prizes available to skywatchers who catch the best views of the spacecraft. The solar sail photo contest is the brainchild of NASA and the skywatching website Spaceweather.com. It invites amateur astronomers to submit their best images of the orbiting NanoSail-D satellite. But first you have to find the NASA solar sail. This NanoSail-D skywatching guide has some tips on how to track the satellite from the ground. On Jan. 20, NanoSail-D became NASA's first successful attempt to unfurl a solar sail in low-Earth orbit — but only after overcoming some glitches and delays. For the photo contest, Spaceweather.com is offering prizes for the best images of the little satellite. The top prize is $500, with second- and third-place winners receiving $300 and $100, respectively, competition organizers said. The website doesn't often hold photo contests, but NanoSail-D is a unique spacecraft presenting unique viewing opportunities, according to Spaceweather.com's Tony Phillips. "How often does a photographer get to record sunlight glinting from a solar sail in Earth orbit?" Phillips told SPACE.com in an e-mail interview. "This will be the first time." The contest is open to all types of images, including telescopic captures of the satellite and simple wide-field camera shots of the sun glinting off the sail's broad, reflective surface. So long as NanoSail-D is in the field of view, the image can be in the running, officials said. "NanoSail-D is about as big as a large tent, and we thought it might be a way to engage the amateur astronomy community," NASA spokeswoman Kim Newton, of the Marshall Space Flight Center, told SPACE.com. Phillips thinks that only a small number of experienced photographers will submit high-resolution telescopic shots of the satellite. But he suspects that many folks will send in simpler camera images that capture NanoSail-D.
glints brightly from the sail's reflective surface." NanoSail-D will be observable for approximately 70 to 120 days before its orbit decays and it burns up, by design, in Earth's atmosphere. The photo contest will continue as long as NanoSail-D stays aloft, officials said. NanoSail-D should be a target of interest to both novice and veteran skywatchers, according to NASA officials. Experienced astrophotographers may race to take the first-ever telescopic pictures of a solar sail unfurled in space. Backyard stargazers, on the other hand, may content themselves with observing the brief but intense flashes of light caused by sunlight glinting off the sail. NanoSail-D could be five to 10 times as bright as the planet Venus, especially later in the mission when the satellite descends to lower and lower orbits, officials said. NASA launched NanoSail-D on Nov. 19 from Kodiak Island, Alaska. It was one of six different scientific payloads aboard a larger satellite called FASTSAT, which is about the size of a washing machine. On Dec. 6, NASA engineers triggered the ejection of NanoSail-D from FASTSAT. But, it didn't work at first. Yet on Jan. 19, NASA announced that the little solar sail satellite had spontaneously popped out on its own and was flying free in space. When it ejected, NanoSail-D initiated a three-day countdown to unfurl its polymer sail, and that countdown hit zero on the night of Jan. 20. Four booms deployed, unfolding the nanosatellite's sail within 5 seconds. NanoSail-D had come back from the brink of failure. "We're solar sailing!" NanoSail-D principal investigator Dean Alhorn, of NASA's Marshall Space Flight Center in Huntsville, Ala., said in a statement. "This is a momentous achievement." NanoSail-D's primary mission is a demonstration of a compact solar sail system. This technology could lead to further development of solar sails for future missions, and could help satellites de-orbit cheaply and efficiently, officials have said. While NanoSail-D is NASA's first big solar sail success, it's not the first craft to demonstrate the technology in space. 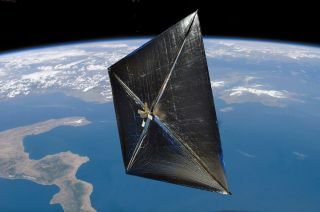 In June 2010, Japan's Ikaros probe deployed its solar sail, becoming the first craft to cruise through space propelled solely by sunlight. You can follow SPACE.com senior writer Mike Wall on Twitter: @michaeldwall. SPACE.com Managing Editor Tariq Malik (@tariqjmalik) contributed to this report.